With credit markets undergoing rapid growth, but also facing changes and threats, and Basel III framework putting a heightened focus on regulatory capital, the need for financial institutions to identify, measure, monitor, and control credit risk – over the entire portfolio, as well as on individual transactions – is greater than ever. KPMG can help financial institutions build a tailored risk governance, risk management and risk reporting framework, using the various tools, models and processes available. 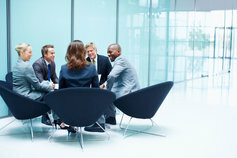 KPMG uses sophisticated statistical and other techniques to develop and implement tailored grading systems for a wide range of customer segments. KPMG has a comprehensive approach to expected loss, which is designed to be consistent with the internal rating based approaches in Basel III framework, embracing estimates of probability of default, exposure at default, realizable collateral values and loss given default on unsecured claims. KPMG can help clients redesign and enhance their processes for collateral management, find suitable software to support these processes and develop concepts for allocating collateral to different exposures. KPMG can help clients determine economic capital utilization. Additionally, risk adjusted performance measurement tools, stress tests tools and framework as well as advice on the selection and implementation of portfolio management models can be provided. KPMG offers advice on the design of credit limit systems that are integrated with the capital management of the financial institutions. Likewise, financial institutions are enabled to align their actual credit risk with their capacity to absorb it. KPMG can review an organization’s credit processes to help ensure that these are aligned with the organization’s overall risk objectives. Furthermore, KPMG can provide recommendations on the appropriate reporting structure and provide assurance on the accuracy and robustness of the internal risk measurement systems.